Matt Shoemaker has worked to build the digital scholarship program on Temple’s campus since 2013. He has created and given workshops in several areas of digital scholarship including making technologies (3D printing, 3D scanning, physical computing, photogrammetry), basics of GIS for digital scholarship, creating digital exhibitions, textual analysis, data cleanup, project design, games for education and as historical models and other DS areas. Prior to coming to Temple University, Shoemaker worked for the Historical Society of Pennsylvania where he led the development of HSP’s digital library, digitization program, and co-authored several successful gran‌t proposals for digital projects. 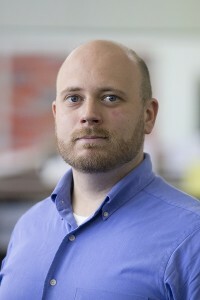 Shoemaker holds an MA in history, focused on French empire in North Africa, and an MLIS with a concentration in archives; both received from the University of Wisconsin Milwaukee. He is currently assisting with a project at the Philadelphia Museum of Art focused on digital uses for their Marcel Duchamp collections as well as co-producing a documentary on the history of Dungeons and Dragons. Matt is also involved with the PhillyDH group and their annual THATCamp Philly Unconference. Please come speak with me if you have any questions about digital scholarship at Temple, digital scholarship and history, project design or other above mentioned projects.